When you think of secluded mountain streams and fly fishing for wild brook, brown, and rainbow trout, do you think of New Jersey? Most people don’t. I stumbled upon them mostly by accident at first. While living in Northern New Jersey for a few years I started looking for more trout streams to fish and streams with extended seasons. I found myself fishing some of the lesser known tributaries of the regular rivers and some of “The Big River” as well. If you think I am withholding some important information you are correct. These special streams cannot withstand heavy angling pressure so I cannot reveal their names. Many have been forgotten by anglers and are only remembered or found by a select, fortunate few. They must be, somewhat, shielded from the masses to protect their delicate ecosystems. Are wild trout streams more important and delicate than stocked waters? No, they are not more important than stocked waters, but they do have to be protected from pollution and abuse. These streams are few and far between in New Jersey and other heavily populated areas. Wild trout are like canaries in a coal mine. When the wild trout and native species disappear they may never come back. Their disappearance is a sign of declining water quality and habitat which may affect the entire watershed. In a state as highly populated and industrialized as New Jersey these special streams have a tendency to be “lost” in more than one way. Some of these streams have indeed already been lost forever. Many of the streams that once held wild fish now may only support stocked fish due to pollution and degradation. Wild fish are unique for many reasons, but their sense of survival is what makes them different from stocked trout. Stocked fish are fed by man and need to learn how to survive in the wild. Wild trout are no more selective than stocked trout by nature, but their natural senses and fears make them harder to catch for the average angler. These trout are more efficient feeders and tend to lie in the prime feeding and cover areas. Wild fish will not move several feet to take a fly. That would be a waste of valuable energy, so accuracy counts. These fish must be hunted and stalked in order to catch them. They fear predators from land, air and water. To be a successful wild trout angler you must fish like the heron. You must think out every move and use stealth to execute the catch. Why fish for wild trout? A good friend and client of mine, John Lopez-Ona, has given me the best analogy for the difference between fishing for stocked and wild trout. Stocked fish are like playing basketball with a lowered hoop. Everyone has a better shot at scoring a basket. Wild fish put you at the top of your game and tend to be a more prized trophy. These challenging trout tend to have more color and fight then your average hatchery fish. Sometimes the best fish aren’t always the biggest. Wild fish are often more rewarding because of there natural beauty and challenge. Where can you find these fish in the state of New Jersey? Most of the major trout streams in New Jersey have one or two wild trout streams as tributaries. These clean, cold streams are what keep the big waters hospitable for all trout. Stocked and wild trout use these undisturbed streams for spawning and cold water refuge. 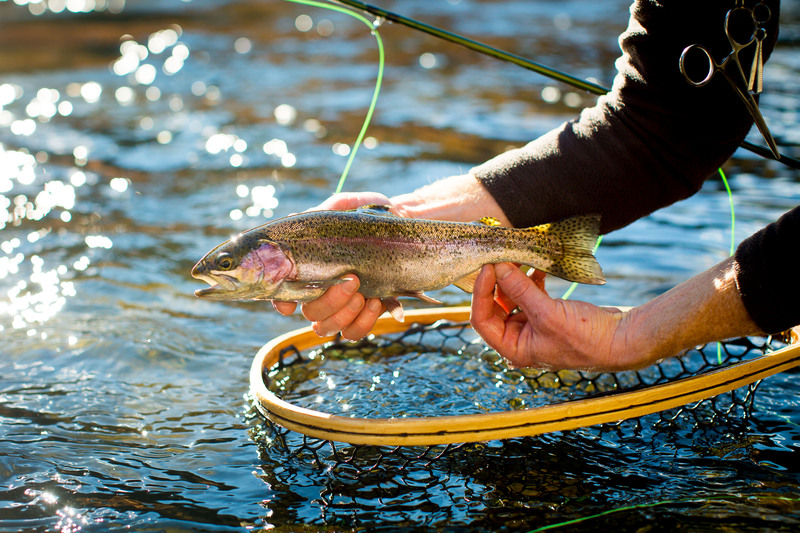 When fishing the stocked waters of the state, keep an eye open for tributaries and head waters that may support trout. Some of these streams may only show signs of small trout at first. As you explore and hunt harder you will find the larger wild trout are the most difficult to catch. On many streams the larger fish are only willing to feed in high water conditions and low light periods. I remember one year, after several days of rain, when the only streams fishable were the small wild trout streams. I arrived at a stream that was 3 times its normal size, but was still somewhat clear. I started off by swinging a streamer in one of the more open pools and immediately hooked a 16 inch wild brown. As I continued to fish this better known wild trout stream I hooked 12 or more fish in two hours that were 9 inches or bigger in a stream that normally produces 6 to 9 inch wild fish. Not all wild trout streams are up high in the mountains of northern New Jersey. Some of these gems are located in more urbanized areas, but are protected by parks and greenways. After pursuing wild trout in the Poconos and Central, PA for several seasons with me, John called me with some exciting news. In a nearby park he had stumbled across a wild trout stream that was almost in his backyard in New Jersey. Very few people fish it or even know it holds fish according to John. It is his local treasure. I had grown up fishing in this put and take area and never even thought wild fish would live that far south in New Jersey. This shows that proper care of our cold water resources can result in natural reproducing wild trout in urban and suburban areas as well. No matter if the streams are deep in seclusion or in a county park the tactics and tackle are very similar. One of the best pieces of equipment a wild trout angler can have is a good topographical map. I use Delorme maps for many reasons, but the main one is that they fit the complete state in one book and I can fit in the back of my truck seat. These maps will lead you to the tributaries and watersheds you would like to explore. They have all the secondary and dirt roads listed and are updated on a regular basis. Find the watershed you want to target and go exploring. The next major selection is the rod choice. Since most of these streams are small, 10-30 feet wide, a 6’6” to 8’ rod is a good choice. I like a 7’ to 8’ 4 or 5 weights for versatility. You should be able to cast small dries or nymphs to medium sized buggers with the same rod. Leaders are standard 7.5 to 9 foot, 4 x to 7x depending on casting room and water clarity. Remember, fish on less pressured streams may not be line shy, but will be people shy. Stay back off the clear pools of these clean streams and make slightly longer, more accurate casts to catch more fish. Fly selection does not have to be complicated. I prefer flies that float well for dry fly fishing for a couple of reasons. The fewer false casts made over clear water, the less fish you will spook and the fewer branches you will catch. Hair wing flies such as Humpies and Stimulators make great choices for prospecting dries. An assortment of standard nymphs with a few Bead Heads included will suffice for most small, wild trout streams. My best producers are Copper Johns and BH Pheasant Tails in 16 and 18. A few streamers and standard wets will round out the selection for those holes where you get approach from down stream or drift a dry. Most of these streams can be fished in hip boots, but be prepared to spend some time crouching and kneeling to sneak up on these alert fish. I have pursued trout in the mid Atlantic region for almost 20 years now and my first trout was caught in New Jersey. Some of my most memorable wild trout fishing occurred on a trout stream filled with browns, brooks and rainbows in North Jersey. My mother-in-law, Carol, mentioned this stream to me when I was in college and told me her father used to fish it. I can only hope that my children will get to fish it and it won’t be “lost” in the future. When and if you find one of these streams, please remember to share them with the right people and work to protect them for future generations.